The three-party delegation that included Associate Professor Charnchai Panthongviriyakul, Dean, Faculty of Medicine, Khon Kaen University (Thailand), paid a courtesy visit to President Shinji Harada on January 20, 2016. Khon Kaen University is the largest university in northeastern Thailand. Since concluding an agreement with Kumamoto University in 2002, university-level exchanges especially in the field of medicine have been actively conducted. During the informal talk with President Harada, opinions were voiced on the possibility of new student exchanges, and the courtesy call ended in a friendly atmosphere. In the course of the three-day visit to Kumamoto University, the delegation held substantive talks with the chief committee member of education, dean of the Faculty of Medicine, and staff in charge of educational affairs on the development of a double-degree program with the Graduate School of Medical Sciences, and on the introduction of a medical student exchange program. In addition, the delegation observed the Center for AIDS Research, the International Research Center for Medical Science, the Radioisotope Center of the Institute of Resource Development and Analysis, and the Institute of Molecular Embryology and Genetics. The visit provided an excellent opportunity to discuss and promote further exchanges between both universities. 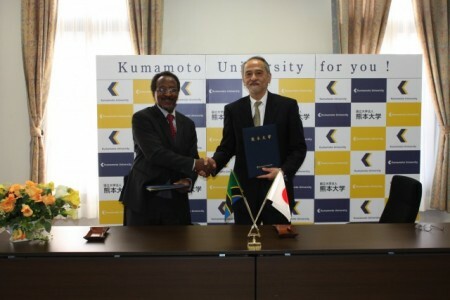 On January 19, 2016, Kumamoto University concluded an academic and student exchange agreement with Tanzania’s Muhimbili University of Health and Allied Sciences (MUHAS). 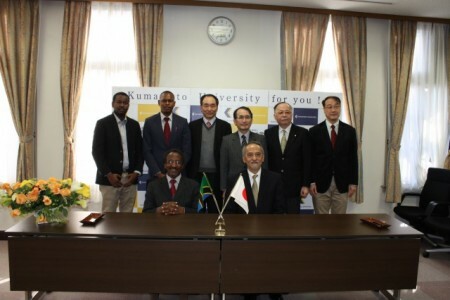 School of Public Health and Allied Sciences, Muhimbili University of Health and Allied Sciences and Kumamoto University’s Center for AIDS Research, Graduate School of Life Science, and Graduate School of Medical Science realized a faculty-level academic exchange agreement in 2003, and in order to expand the range of these exchanges, a new academic and student exchange agreement was recently concluded between the two universities. MUHAS is the top national university in the field of life sciences in Tanzania, and the university plays a leading role in the development of human resources in the field of medicine. Together with Kumamoto University, both joint research and researcher exchanges have been conducted in the fields of infectious diseases and AIDS research, and students have enrolled in the doctoral course in medical science. In these ways, diverse and meaningful academic and student exchanges are being conducted. Deputy Vice Chancellor Eligius Lyamuya and Dr. Bruno Sunguya, Lecturer, Muhimbili University of Health and Allied Sciences, participated in the signing ceremony. Witnessed by staff members of both universities, Deputy Vice Chancellor Lyamuya and President Shinji Harada placed their signatures on the agreement and shook hands firmly. After the conclusion of this agreement, expanded exchanges throughout the university as well as the development of exchanges in new fields are also expected. Kumamoto University recently attended ‘the Study in Japan Fair 2015 (International Education Fair: Malaysia)’ held by the Japan Student Services Organization (JASSO) on December 19 and 20, and ‘the Study in Japan Info Day’ hosted by the Institut Bahasa Teikyo, held on December 21. 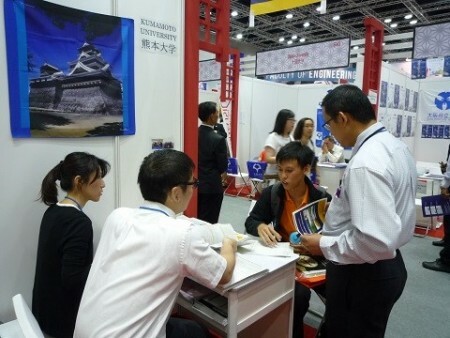 ‘The Study in Japan Fair 2015’ is held with the participation of Japanese educational institutions so that local students who wish to study in Japan can find an educational institution that best matches their expectations, so they can achieve their academic pursuits in Japan. 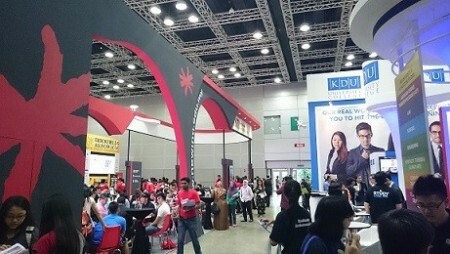 Approximately 3,500 local students visited the Japanese pavilion in this fair. 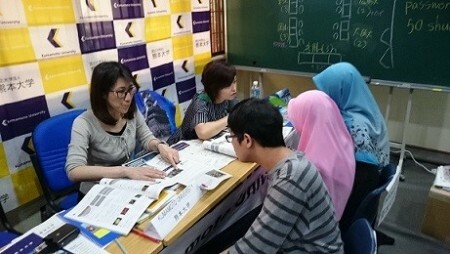 Our staff members used documents and posters to explain the University’s characteristics and the procedures required to study in Japan, to 92 students visited our booth. Institut Bahasa Teikyo (IBT), the host organization of ‘the Study in Japan Info Day’, is one of the overseas educational institutions established by the Teikyo University Group. IBT provides students in Malaysia who wish to study in Japan with courses in Japanese language and basic subjects (e.g. mathematics, physics, chemistry, social studies and English). ‘The Study in Japan Info Day’ was held for the first time, 10 universities including Kumamoto University and a vocational college in Japan attended the event. We provided IBT students and local visitors with information about the University using briefing materials. At both events, students visiting our booth were very much interested in Japan. In particular, many IBT students have already attained Japanese proficiency at the level of being able to handle a normal conversation with native Japanese speakers, and are very eager to study in Japan. Attending these events has increased recognition of our University in Malaysia. Moreover, it was a valuable opportunity for us to interact directly with local students and understand their profound desire to study in Japan.